After launching it in China last month, Huawei announced that it’s bringing its Honor 8 flagship smartphone to the US today. It’s the company’s first device to arrive on American shores with dual cameras and the Kirin processor, developed in-house. The Android Marshmallow-based Honor 8 features a 5.2-inch 1080p display, dual 12-megapixel rear cameras, an 8-megapixel front camera with flash, and a USB-C charging port. Under the hood, you’ll find an octa-core Kirin 950 processor running at 2.3 GHz, 4GB RAM and your choice of either 32GB or GB of internal storage. There’s also a microSD card slot for adding up to 128GB more space, and a 3,000mAh battery with support for fast charging (Huawei promises 47 percent of power in 30 minutes). The chassis is made of an aluminium alloy and feature curved glass on the back and front, with extensive processing on the rear surface to catch the light in a unique way. Of course, this phone is all about the dual cameras. They work in tandem – one lens captures color and the other is a monochrome lens that’s said to bring in more light and assist with sharpness. There are 17 different shooting modes to experiment with, including one with extensive manual controls. The fingerprint sensor on the back doubles as a programmable button that you can set to perform actions like launch your favorite app. You can also create custom commands for when you tap your knuckle on the screen. It’s worth noting that Huawei’s P9 also sports dual cameras; the shooters on that model were co-engineered by the company along with legendary camera manufacturer Leica. It isn’t clear if that makes much of a difference in image quality – you’ll have to wait for a detailed review to learn more. The Honor 8 is available for pre-order now, with the 32GB model going for $400 and shipping by the end of August. That pits it against the identically-priced OnePlus 3 and the ZTE Axon 7, both of which feature powerful specifications and gorgeous styling. Of course, I’m already drawn to Huawei’s offering because of my penchant for smaller phones that are easier to use with one hand. 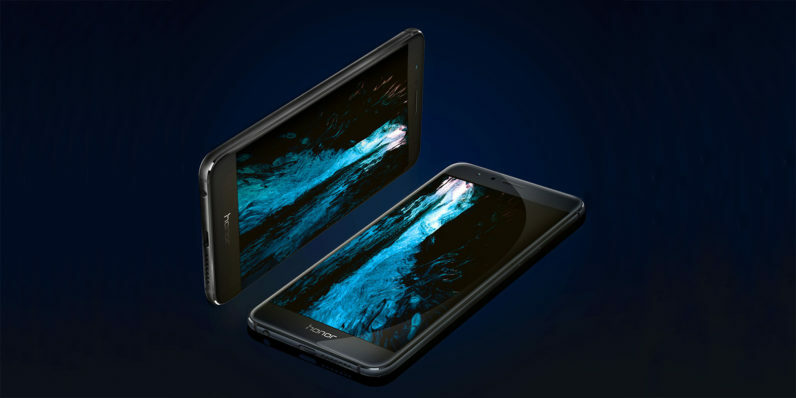 You can pre-order the Honor 8 now in Pearl White, Sapphire Blue and Midnight Black from Best Buy, Amazon, Newegg, and B&H Photo Video, as well from HiHonor.com; all retailers are offering a $50 coupon/rebate on the device until August 31.